We all knew this was coming, yet somehow it doesn’t lessen the sting. The man was ninety-five years old (and would have been ninety-six in December). Honestly, with all the obits I’ve been writing these past few months, the thought did occur to me that I might want to get a head start on writing one for Stan Lee. But I simply could not bring myself to do so. I just didn’t want to face it; did not even want to consider the possibility of living in a world without Smilin’ Stan. But now the day has come. Stan Lee died yesterday. From Foom #17 (Mar. 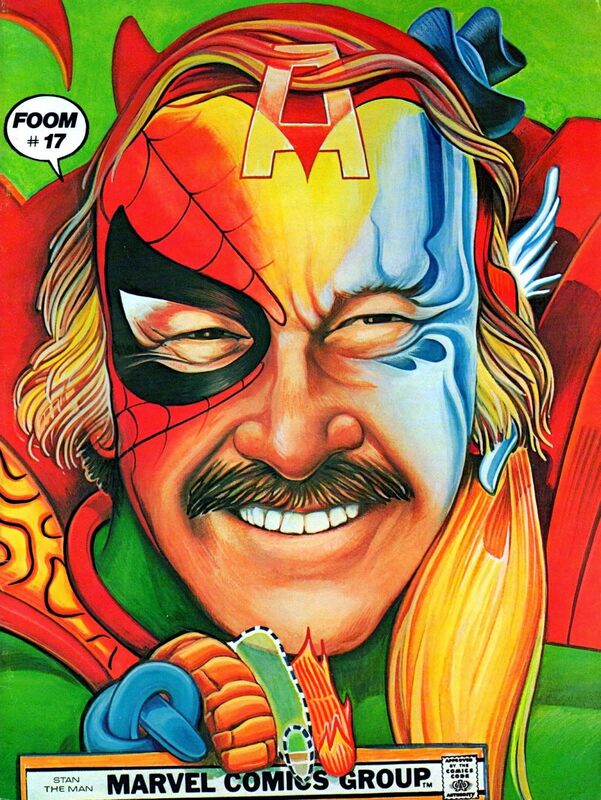 1977), a painted cover of Stan by Arnold Sawyer. Usually in a blogpost of this nature, I review my subject’s accomplishments, but that would be ridiculous here. Stan had a hand in nearly everything I love about comics, and that’s saying one hell of a lot. 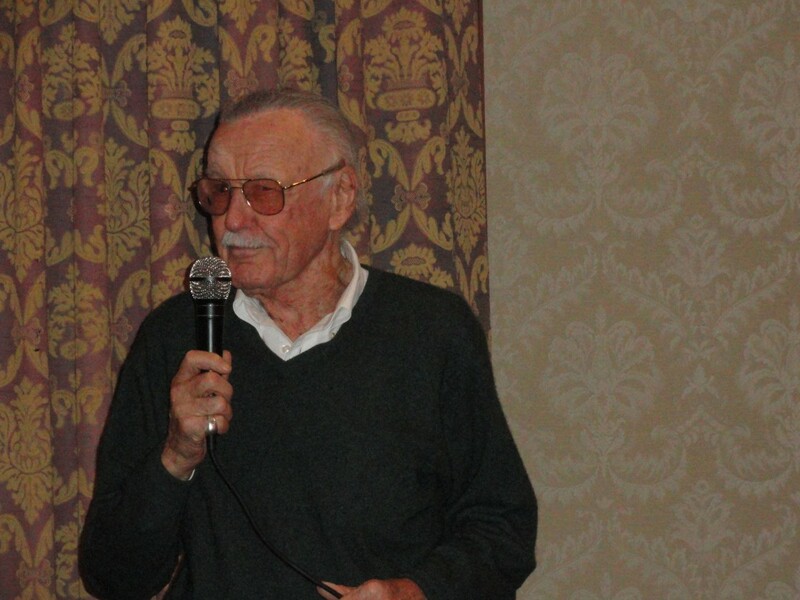 Marvel Comics got its start with Stan Lee’s desire to do something different and better than the formula stories he’d worked on for the two decades prior. The comics he subsequently wrote and edited may not impress modern, first-time readers today, but they were a quantum leap ahead of what came before. In addition to his creative efforts, we should also acknowledge his editorial style, how he engaged his readers, made them feel like they were a part of the revolution that was then taking place in the comics industry. He made it feel like creating the comics was even more fun than reading them. He offered a peek behind the curtain, giving you a glimpse of the people that worked at Marvel—not just the artists and writers, but others that worked in the office, like Fabulous Flo Steinberg, his secretary. From my own generational perspective, he was, at first, just a name I’d see on the opening page of every Marvel comic I bought. “Stan Lee presents,” it would say. As I bought more and more reprint books (and more and more back issues), I discovered just how much he’d done to make the Marvel Universe that I loved so well. He quickly became a god to me. In particular, it’s the name at the very top that strikes me: STAN LEE. I was not yet fifteen years old. I had to beg my father to take me into the city for this. I told him with great exuberance, “Stan Lee is going to be there! !” He had no idea who this was, but he eventually relented. If memory serves, we purchased our tickets for the event at The Complete Strategist in Montclair. We chose to go on Sunday, June 24—probably because those tickets were two bucks cheaper. Big mistake. The place was practically a wasteland by the time we arrived. While there were still a number of fans present, and a lot of dealer’s tables, there were no comics pros left (at least none that I recognized), and certainly no Stan Lee. I bought some old comics and went home disappointed. 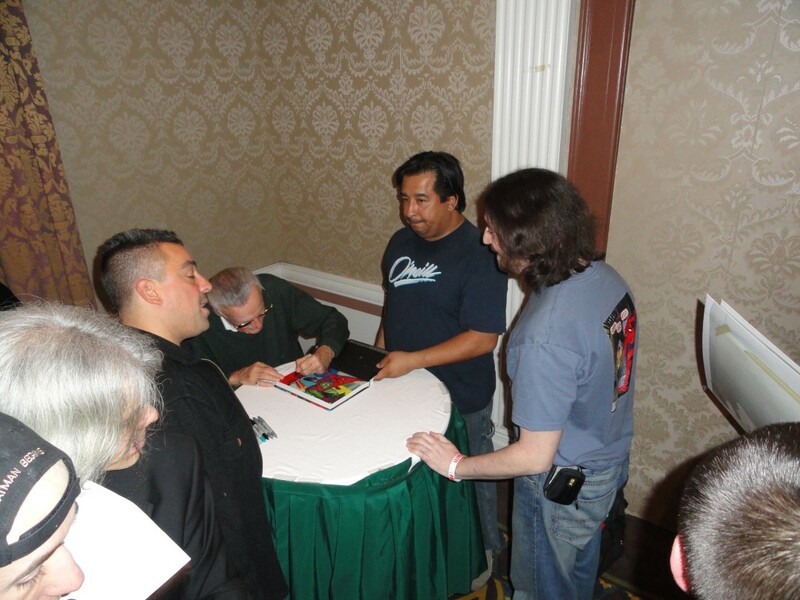 So there I am in the Gold Ballroom at the Hotel Pennsylvania, chatting up George Pérez and Chris Claremont and meeting up with some fellow fans before Stan finally appears. “Hey Stan, I’ve waited 28 years for this!” He smiled and laughed. Doh! This was as close as I could get to having my picture taken with “The Man.” We’re in the same frame, at least. …Yeah, I was in the middle of my “Jesus look” hair experiment at the time. I thought it looked good on me, but basically on one else among my friends and family agreed. Also: that’s one of my classic homemade tees I’m wearing, with the cover of ASM #50 on the front, and the full page splash of Pete walking away from the garbage can on the back. I don’t think Stan noticed it. 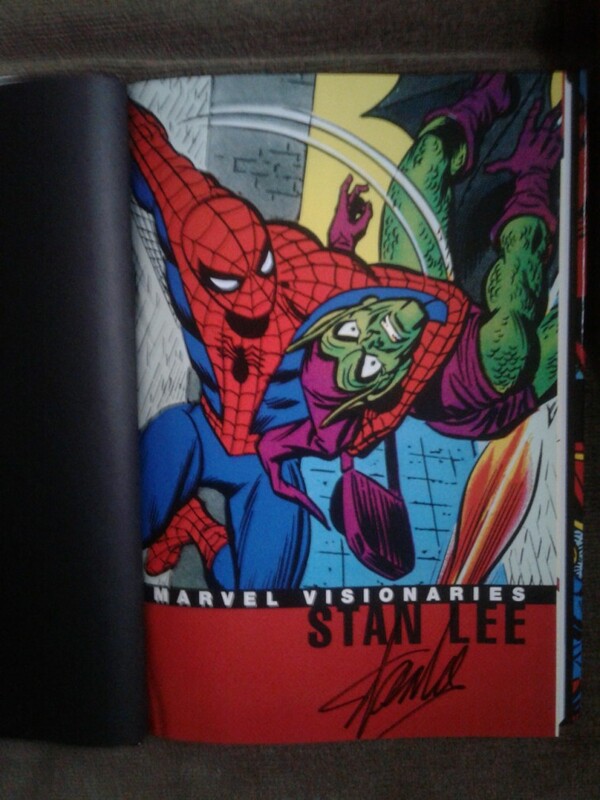 On the bright side, I did get him to sign his Visionaries book for me. 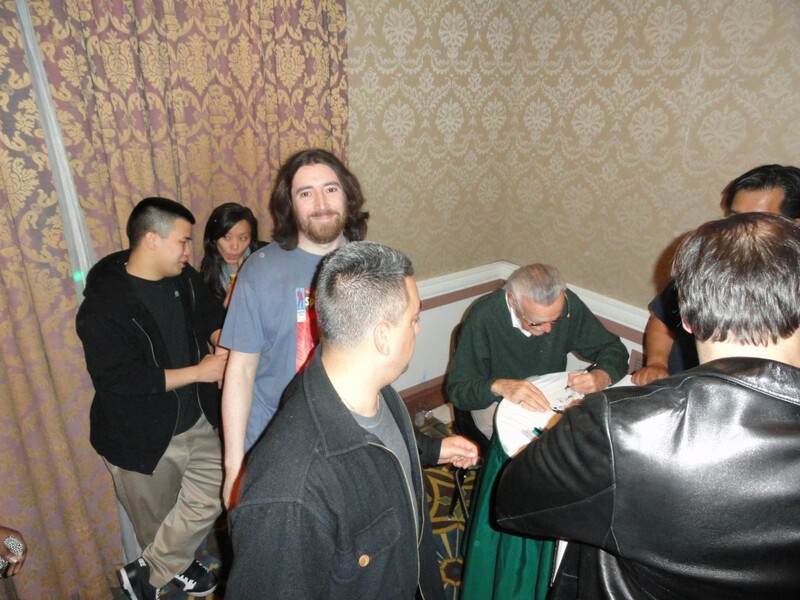 …And I did get to ever-so-briefly meet the man and offer some words of admiration. Better than nothing, I suppose. To offer a better perspective on Stan Lee’s impact on comics and pop culture, let’s try and imagine a world without Stan Lee in it. It’s 1960, ’61, and some other guy is working for Martin Goodman as editor-in-chief of his comics line. Goodman tells him, “hey, Justice League of America is doing great business over at DC, we should get back into superheroes.” Most likely, whoever the editor is, he’s going to try to come up with some kind of cheap knock off, JLA-clone concept that likely dies out relatively quickly. Yeah, that’s not happening and we all know it. It took Stan Lee to do these things. The approach was all him, and the commercial aspects that made it so successful? Also all him. Not Kirby, not Ditko, not anyone else. Stan Lee. Best case scenario: The JLA clone Goodman publishes does okay for awhile but then peters out after a couple years. DC continues to dominate the comics landscape with utterly banal and juvenile superhero comics. Other companies do some okay business with monster comics and Archie-style humor. The comics business may go on, but its influence on the larger pop-culture landscape is virtually zero. On a more personal level, how would it have affected my own fandom had there been no Stan Lee? I still probably buy a bunch of DC superhero books as a kid, but eventually get bored with them and abandon the hobby completely by fifth or sixth grade. In other words, I live a completely different life and become another person entirely. And I’m sure I’m not the only one—there have to be tens of thousands of people whose lives would have been changed just as much if not more. Maybe hundreds of thousands. Maybe millions. Some might think I’m being a bit harsh regarding the prospects of the comics industry without Stan Lee. After all, there were a ton of great writers and artists that entered the industry after Stan had essentially left it in the early 70s, right? Absolutely. But how many would have even been comics fans, let alone become creators themselves, had Stan Lee’s Marvel never existed to excite and inspire them? Not many. Possibly not any. I’ve said it several times (at least) over many blogposts these last five years, but it bears repeating: Stan Lee’s approach was to move on from the typical one-dimensional treatment of characterization in most comics and make his characters two-dimensional. This doesn’t sound like much on the surface, but in reality it was world changing for the comics business. 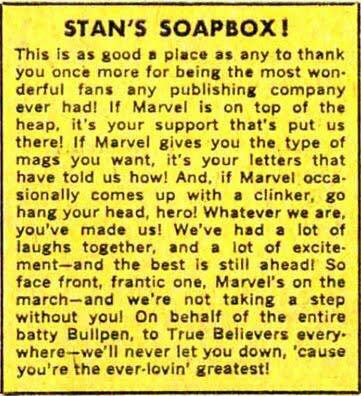 Without Stan, we’ll never know if comics would have ever made it out of the comics-code-authority-enforced swamp in which it was mired when Marvel started. At a time like this, it would be nice if we could just remember Stan Lee fondly, but of course that’s impossible. Somebody’s got to bring up Stan being a glory hound and taking too much credit away from Jack Kirby and Steve Ditko for their contributions to the Marvel Universe. So I’m addressing this in the most succinct terms I can. Back in the 60s and 70s, nearly all the credit and glory for Marvel’s success went to Stan Lee, and this was unfair to Kirby and Ditko. Beginning in the mid-1980s, the pendulum swung the opposite way and Lee’s contributions were minimized, even derided in some circles—and this was equally unfair to Stan. If you want to know who contributed what to their collaborations, it’s really not that difficult, as both Kirby and Ditko did a fair amount of solo work after breaking with Lee. Looking at Kirby’s solo work, you can see incredible characters, awe-inspiring creativity, and epic scope. With Ditko, you get that unique design sense, fascinating characters, and originality dripping from every panel. So what’s missing? It always seemed obvious to me: deeper characterization, warmth, humanity, witty dialogue, and humor. Also, at his peak, Stan had the best commercial instincts in the game. All these things in his collaborations with Kirby and Ditko (and others) clearly came from Stan Lee. When you read a Stan Lee comic, there was always something in it that brought a smile to your face. At his best, Stan’s writing made you happy to be alive and part of the world. 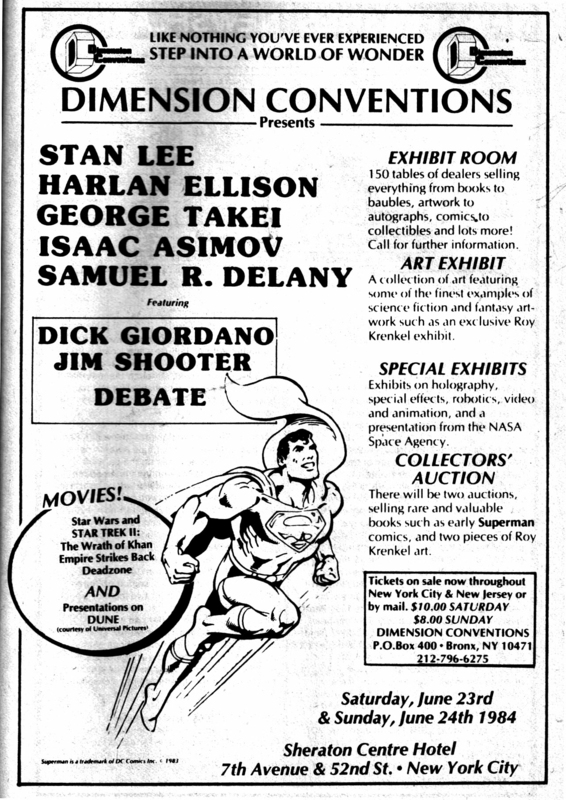 Even after he stopped writing comics regularly, he was still a great ambassador for the industry. Wherever he was, whenever you saw him, he always seemed to be smiling; always putting out positive vibes. Most people today know him best as the guy who makes the cameos in the Marvel films, and maybe from some of his voiceover work on Marvel’s animated projects. Whatever he did, he always seemed to be enjoying himself. …Sorry folks, I couldn’t resist. In the words of Roy Thomas, he was “one of the most important mythmakers of the 20th century.” He will be sorely missed. R.I.P., Stan “The Man” Lee.